The Eastern Coachworks bus building factory situated in Lowestoft, Suffolk was closed in 1987. Over the weekend of the 8th and 9th July 2017 the East Anglia Transport Museum at Carlton Colville, near Lowestoft, staged an excellent event to mark 30 years since it’s closure. The independent transport videos cameras were on hand to record the event just as they did in 2012 when the 25th year was also commemorated. A good number of preserved ECW-bodied buses were invited to take part in the event and these turned up from many parts of the United Kingdom. The variety of visiting vehicles brought back memories of forgotten liveries and fleets that are now no more. The East Anglia Transport Museum is home to an interesting collection of trolleybuses and trams. On the days of filming they were running London Transport and Maidstone Corporation trolleybuses as well as a London Transport and a Blackpool Corporation tramcar. In some cases, back in the day, these electric vehicles would encounter buses and coaches with ECW bodies whilst in service. Our filming on the Saturday begins at the Museum before the doors were open to the general public catching the arrival of the visiting ECW-bodied buses and coaches. As before, the Museum’s car park is utilised as a bus station for the departures to Lowestoft town centre or Beccles. Visitors had to park their cars off site and use a Park & Ride service that was operated by First Eastern Counties using the appropriately registered 37572 (AU58 ECW), a Volvo B9TL with a Wrightbus Eclipse Gemini body! Our cameras sampled rides on three ECW-bodied vehicles. LFL57 (557 BNG) a Bristol FL6G with an ECW H70RD body formally operated by Eastern Counties and from the same fleet we ride on LC556 (3003 AH) a Bristol SC4LK with a B35F ECW body. We also ride on 4 (YRT 898H) an AEC Swift with a B45D ECW body that was operated by the local municipality, Lowestoft Corporation. This interesting bus has a body that would normally be found on a Bristol RE chassis, but sounds like an AEC Routemaster! Plenty of action is filmed in and around the Museum before the preparation for the evening road run to the picturesque Gunton Cliffs. Our cameras travel on former Lowestoft Corporation AEC Regent II, 21 (GBJ 192) with ECW H56R bodywork. The route takes us past the retail park that was once the site of the ECW factory. Quite a spectacle as some 26 ECW bodied buses and coaches make their way through Lowestoft on a sunny July summer’s evening to Gunton Cliffs where our cameras film the parade arriving. On returning to the Museum we film the buses and coaches arriving back from the parade. Our Sunday morning filming starts again at the Museum as we capture even more ECW-bodied buses and coaches as they arrive for the day. We take a ride to Lowestoft onboard YDX221 (NWU 265D) a Bristol FS6B with ECW H60RD bodywork from the York-West Yorkshire fleet, and return to the Museum onboard LL711 (KNG 711) a Bristol L5G with ECW B35R bodywork from the Eastern Counties fleet. Look out for PLZ 2876, a rare low-height, long wheelbase Leyland Olympian/ECW bodied coach double-decker. It was formally known as 4510 (D510 PPU) in the Eastern National fleet and is a welcome arrival to the preservation scene. Our filming concludes on Chapel Road outside the Museum as the vehicles depart, ending a superb weekend and fitting tribute to these well-loved buses. 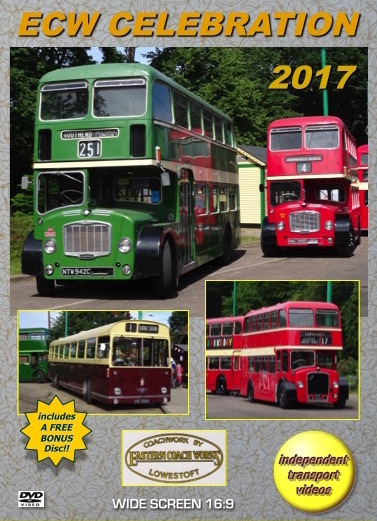 We include a bonus disc with a unique chance to ride in the cab of LKD229 (OVF 229) the 1954 Bristol LD5G with ECW H58RD bodywork. Travel with us on the evening road run to Gunton Cliffs on this beautifully preserved former Eastern Counties bus. Enjoy! !